As members of the 2040 Matters community know, it has been quite a while since our last Post. But our silence for the past 6 months has not been a sign of surrender. To the contrary, we have been hard at work launching a new business designed to further many of the goals that we set for ourselves when we started this Blog. For the past six months, we have been investing in social entrepreneurship and community-led economic development right here in Santa Barbara. The result is www.Driving2Save.com. As you can see from the Site, we have followed our own advice while advancing the cause of 2040 Matters. The leadership team at Driving2Save is drawn from Westmont College and the Bren School at UCSB. We are creating jobs for talented young people in our community. The business itself, moreover, is entirely about building a brighter future. As the trusted advisor to conscientious drivers everywhere, Driving2Save provides free advice, economic analysis, and consumer product testing so that drivers can transform the driving experience into one that is more enjoyable and less costly for everyone. Driving2Save also gives at least 2% of its profits to charities with similar goals. If you care about saving lives, money, time, or the planet, you should be a member of the Driving2Save community. 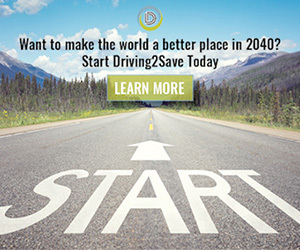 Join the movement today by visiting www.Driving2Save.com.